Yeah, so the last two weeks I’ve been a slacker-only posting Friday Favorites. Sigh…I could list all the excuses, but they don’t matter. So, goal for next week-at least three posts. Hold me to it. We all know dental care is important for humans, but did you also know it’s just as important for your dogs? 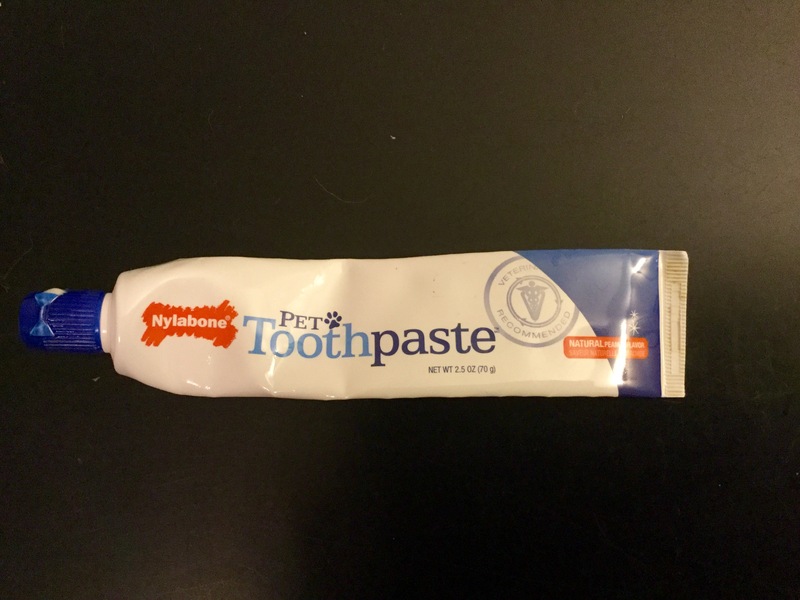 I intend to do a post devoted solely to canine dental care, but for today I’m just going to post my favorite doggy toothpaste. We love our veterinarian and the staff at Avenue Animal Hospital. If you live near Mount Juliet, Tennessee check them out. Tell them Jack, Jade, and Damon sent you. Here’s their website. They also have a Facebook page. I know what you mean about trying to stick to a blogging schedule, there are always so many other competing priorities – UGH, it’s not easy! I didn’t know Nylabone made a doggie toothpaste, that’s great to know! Thanks. So glad I’m not the only one who struggles with a blogging schedule. Thanks for stopping by! Interestingly #Finndawg doesn’t seem to be interested in Peanut Butter flavoured things… he must be the only dog in the world who can resisit it!! I’m trying Chicken flavoured… wish us luck! It’s such a smart idea to brush your dog’s teeth regularly. Those dental procedures are really expensive! It’s cool that they made it peanut butter flavored. I bet your dog enjoys that. They do enjoy it. Although it does take some consistent training to get dogs to allow their teeth to be brushed. Well worth it, though. Thanks for stopping by. YAY for teeth brushing – we brush every day and never need a professional cleaning. I think it’s one of the most important things we can do for our dogs. Peanut butter toothpaste sounds delicious. Love the idea of Friday Favourites and Kilo would love this toothpaste (we both love peanut butter!!). Peanutbutter is definitely a fave in our house among canines and humans!! LOL! Yup, brushing doggy teeths is super important for our health! Thanks for sharing dis important tip with your readers! Tashi would love that — thanks for introducing it! Nylabone also makes a plaque fighter liquid that goes in the water dish, though I haven’t tried it. I have seen that plaque fighting liquid. I haven’t tried it yet either. Thanks for stopping by! I didn’t know you could get peanut butter toothpaste in the US, but guess it makes sense, it seems to be a national obsession 🙂 MOL. Peanutbutter is definitely an obsession in our house-more with the humans than the furries!!! BOL!!!! We use the CET toothpaste. Mr. N doesn’t really seem to have a preference on flavor though. I didn’t realize Nylabone made toothpaste for dogs! Awesome! Our three love the peanutbutter flavor! This reminds me that I need to get more toothpaste for my dogs! Great idea to do Friday Favorites! I have a hard time sticking to my blogging schedule, too. I end up feeling like I want to write about something other than what’s in my editorial calendar. Resolutions! Glad I’m not the only one! My goal for the weekend is to write and schedule 3 posts for next week.